We are about six weeks away from the Summer Reunion Party. Here is the latest info. No need to send money ahead of time. Just pay at the door. But please RSVP if you are planning to attend. That’s right, the class list has now been expanded to cover Leuzinger graduating classes from 1961 through 1964. 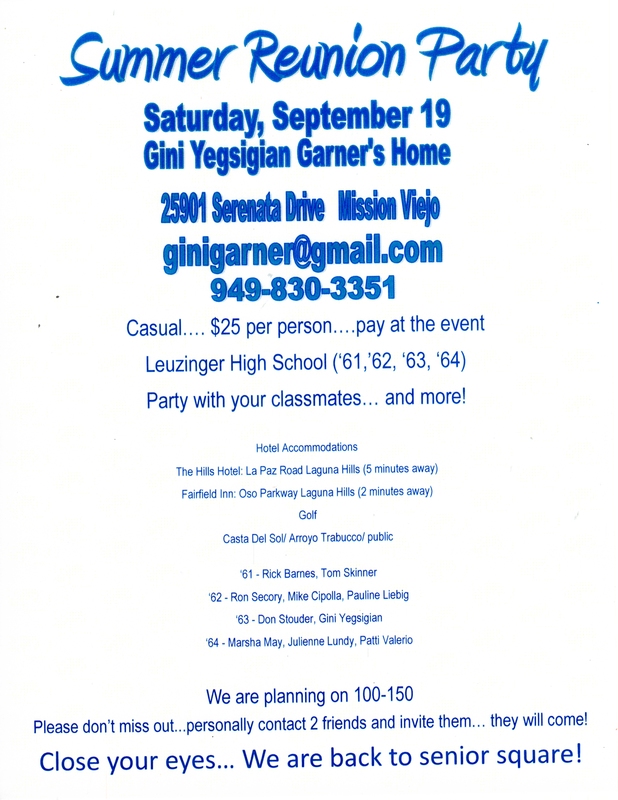 Also, Gini’s phone number is somewhat hard to read in the flyer. It is (949) 830-3351. It will help us out if you would begin to RSVP. It is not necessary to send any money yet. You can send it later, or pay at the door. We’re just trying to get a handle on how many people to expect. There has already been a lot of interest. If you are planning to attend from out of town, there are hotels nearby, one quite close to Gini’s house with reasonable rates, the Fairfield Inn. It’s been awhile since I posted anything here. Quite understandably, there has been little news to pass on. Unfortunately, our In Memory list has grown by one. As previously posted, Karen Martin passed away in January. 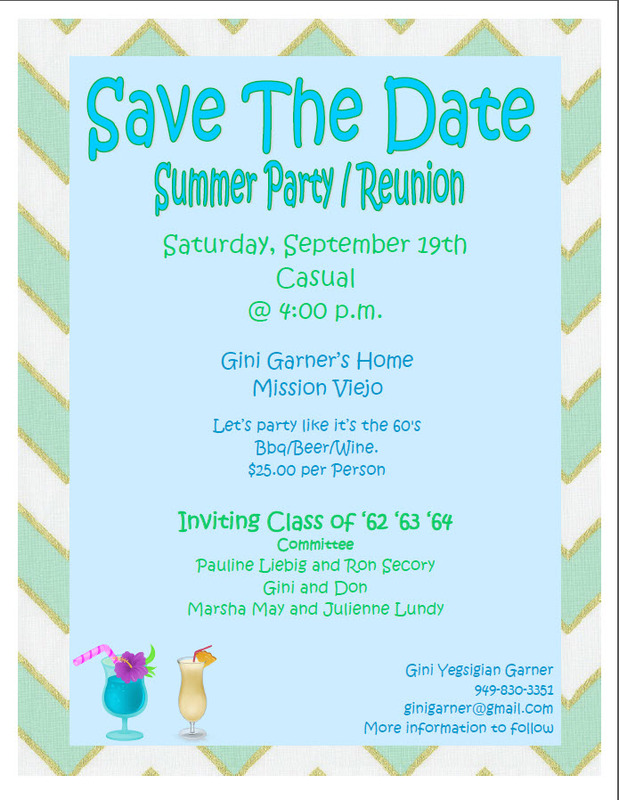 I recently sent out an email to everyone about the mini-reunion Gini this coming Sunday, June 22nd. Unfortunately, as is often the case, an email comes back as being undeliverable. This time, Richard Johnson’s email address is not valid anymore. If anyone is in contact with Richard, please have him email me so I can get him back on the list. Remember, if you change email addresses let me know. We do not want to lose you. Just in case you did not get the email regarding the mini-reunion, it is repeated here. I realize this is awfully late. But Gini Yegsigian is having a gathering at her home on Sunday, June 22nd from 4-8 pm. 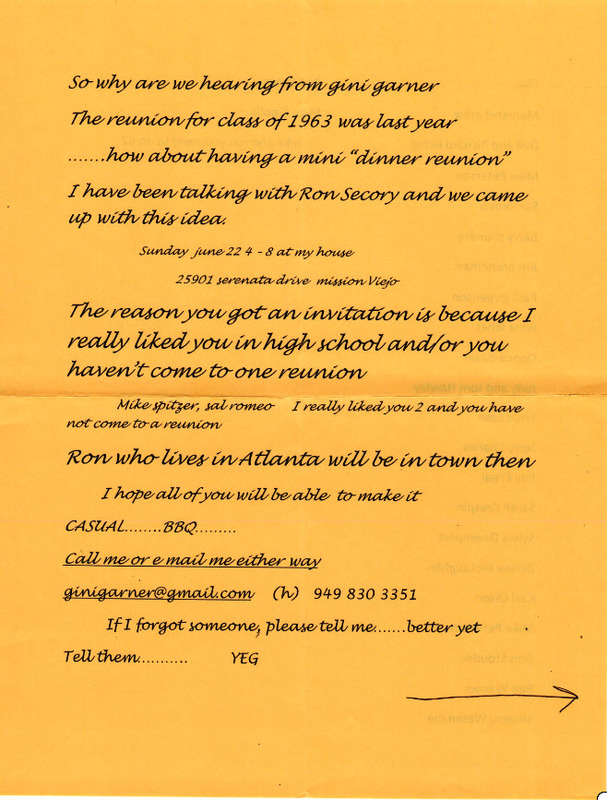 What started out as a simple opportunity to see Ron Secory from the class of 1962 while he is in town from GA has mushroomed into a full-fledged mini-reunion. We’re hoping that as many of you as possible can attend. Below you will see Gini’s phone number and address. I have no information about what you can bring or donations. So please RSVP to Gini directly to find out the answer to those questions. We hope to see as many of you as possible, especially those of you who were unable to attend our 50th Reunion. I just posted the latest version of our Missing Classmates list. The 133 people on the list represent about one-half of our class. Hopefully, there are people on it that are not missing at all, and you know how to contact them. If that is the case, please leave a comment or email Don Stouder at donstouder@ca.rr.com and let us know how we can contact them. If you are on the list, please do the same. You do not want to be like Tom Sawyer. Our 50th Reunion is not that far off. It is not too early to begin searching for our classmates who have gone missing.